If a worksheet is larger than one printed page, you can label data by adding row and column headings that will appear on each print page. These labels are also known as print titles. 1. 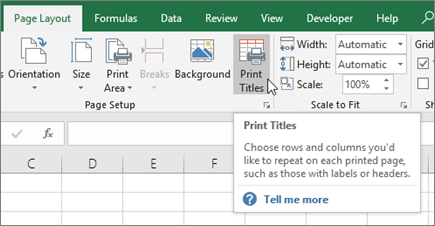 On the worksheet that you want to print, in the Page Layout tab, click Print Titles. In the Rows to repeat at top box, enter the reference of the rows that contain the column labels, such as $1:$1. In the Columns to repeat at left box, enter the reference of the columns that contain the row labels, such as $A:$F. In the example below, only the top row of the workbook would appear at the top of every printed page. If you wanted to print the top two rows, you would enter $1:$2. 3. Click Print Preview to verify the results.